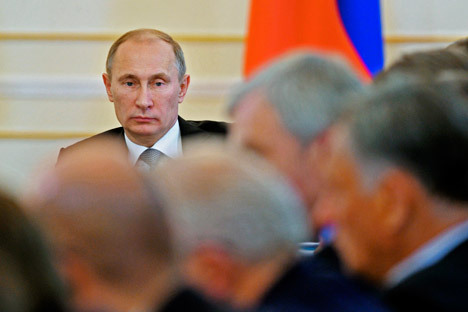 Foreign investors’ perceptions of Russia could improve by late 2013. According to analysts at Citigroup Inc., the country’s attractiveness for investment will rise, and the discount on the country’s markets will drop by nearly double, to 20 percent. “Currently the discount is even higher than after the Yukos case, at 40 percent – for emerging markets it’s 35 percent of the oil price.” Experts believe that efforts made by Vladimir Putin have influenced this outcome. Putin pledged to increase both the GDP and the ratio of investment to GDP by 4 percent and 27 percent, respectively. By 2018, these increases would bring the country’s position in the Doing Business ratings up from 120th to 20th, say analysts. Russia’s World Bank ranking improved for 2013, from 120th to 112th – between Palau and Salvador. The word of former President Dmitry Medvedev was rarely followed through in action, leaving investors skeptical about statements made by officials, state Citi analysts. Putin’s demands that the system be changed have led to a 22-point “road map” from the Agency of Strategic Initiatives, which includes the simplification of Customs procedures, support for exporters of non-oil products, gaining access to the energy infrastructure, and shortening application periods for building permits. Specific and achievable goals have emerged, in contrast to the previous theoretical plans put forth during the tenure of former head of the Ministry of Economic Development, German Gref. “Now political control and economic reform are going hand-in-hand,” say analysts. Putin remained the coordinator for policy during the Medvedev presidency, despite his position as Prime Minister, commented Yulia Tseplyaeva of BNP Paribas. “Without his consultation major decisions were simply impossible.” Analysts from the Economist Intelligence Unit (EIU) have a different opinion from the experts at Citi. “Less effort will be put into improving the climate for investors and speeding up privatization during Putin’s presidency. Russia made great progress during Putin’s first presidency, when the government reduced and simplified taxation, cut down red tape, simplified business registration – but then the reforms conked out, and in some areas there was a backlash,” they added. Even if the pace of reform is sustained, real improvements will be slow in coming. Reform of the court system is a basic requirement, analysts from EIU claim. This all amounts to a kind of authoritarian modernization. It is unlikely to work in Russia because of its high levels of corruption, centralization, lack of rotation in circles of elite, and poor-quality bureaucracy, says Lilia Shevtsova from the Carnegie Institute. Without reform, Russia’s economic growth rate can only hit 2 percent, whereas 4 percent is needed to make good on the President’s pledges to improve social obligations. Economics Minister Andrei Belousov says that reforms are essential to bridge this shortfall. However, as Citi remarks, it is not worth waiting for radical changes, since the same people are still in the government – there is a risk of back-pedaling on strategy for political expediency. The full article was publishe in Russian in Vedomosti.